Dwight D. Eisenhower was born October 14, 1890 in Denison, Texas. His great-grandparents had emigrated to the United States in 1741 sailing from the Netherlands to Delaware. As farmers, they settled in Pennsylvania. Dwight's grandfather was a Mennonite* preacher of a community known as the River Brethren. The Eisenhowers opposed slavery, but did not fight in the Civil War because they were pacifists who didn't believe in fighting. Some of them, however, did go against the church's teaching and fought in the Union Army. Eisenhower's parents, David and Ida married in 1885 and David's parents gave them $2000 and 160 acres of land. Unlike the rest of his family, David refused to speak German to his wife and children. He thought they would have more opportunities if English was their primary language. They opened a store, which failed, then moved to Texas first to Tyler, then Denison where Dwight their third son was born two years later, followed by four more sons. Later Eisenhowere would say the family was poor, but they never knew it. Dwight helped out by going door to door selling vegatables from their garden. Each son had a small plot in the family garden to raise produce to sell. In school Ike loved history and neglected his other studies and chores to study Greek and Roman History. His mother didn't like for him to read books about war and the military, and once she took the books and locked them in a closet. When he was a freshman in high school he fell and scraped his knee. When it became infected, the doctor said his leg would have to be amputated. Ike could not bear to think of losing his leg. He begged his brother Edgar to stop them if they tried to remove it. His parents finally agreed that the leg should have a chance to heal on its own. It did heal and Ike's leg was saved. Ike and his brother Ed planned to put each other through college by each working to pay for the other's expenses. Ike worked to support his brother for two years in a creamery* where Mr. Eisenhower worked. At the creamery he pulled 300 pound blocks of ice which were used to cool the milk and butter. After that he decided to further his own education. He applied at the Naval Academy, but at age 20 was too old to be accepted. However, he had an opportunity to enroll in the military academy at West Point. Many military leaders had been trained at West Point. George Washington had used it as his headquarters, and Thomas Jefferson had started the military academy there in 1802. After his graduation from the military academy he was assigned as a second lieutenant at Fort Sam Houston. He wanted to serve in combat in France, but they assigned him to be a teacher training the troops and also he was the football coach. When he met Mamie Doud, they were instantly attracted to each other. They became engaged and decided to marry soon because due to trouble in Mexico, Ike was going to be reassigned. Right before the wedding he was promoted to first lieutenant and began earning $20 more a month which was a welcome addition to the $141.67 a month which he received. After they were married they traveled to visit Ike's parents and Mamie was surprised at how differently their families lived. She had been raised in an aristocratic* family and Ike's family had been poor. Their first son, Doud Dwight died at age three of scarlet fever. The following year their son John was born. The United States had been drawn into World War 1 by the sinking of the liner the Lusitania on May 7, 1915 by a German submarine. There were 128 Americans among the 2000 civilians who died when the ship sank. The newest weapon the army had at that time was the armored tank and Eisenhower was assigned to train soldiers in tank warfare. Earlier in their quest to learn everything about the tank, he and George Patton disassembled a tank, put it back together, and drove it. Several years later Eisenhower served under General Fox Conner in Panama and then Douglas MacArthur in the Philippines. During this time Germany, Italy, and Japan formed a group which was known as the Axis. They began invading other countries. The dictator Adolph Hitler was the German leader. Eisenhower was certain the Americans would be drawn into the conflict. The isolationists* said America should not enter the war unless the country was attacked. That attack came on December 7, 1941 when the Japanese attacked Pearl Harbor in Hawaii. More than 2300 people died and another 2000 were wounded. When World War 2 started he was promoted to brigadier general and returned to the United States. His next promotions were to major general, then Commander in Chief of the Allied Forces in North Africa. During World War 2 the landing on the coast of Normandy was crucial to the Allies winning the war. The maneuver was called by the code-name Operation Overlord. It involved tens of thousands of U.S., British, and Canadian soldiers. The landing was called D-Day. Eisenhower had been responsible for planning the invasion of Europe. When he met with the troops he told them, "Don't worry, you have the best equipment and the best leaders." A sergeant replied, "We ain't worried, General." Thousands of soldiers died in the battle, but the campaign was noted as successful. In December 1944 a battle took place in Belgium. It was called the Battle of the Bulge because the Germans pushing back the allied troops caused a bulge in the Allied line on war maps. Fierce fighting continued for months, but the war with Germany was over on May 7, 1945 when Germany surrendered. People over the world celebrated the Victory in Europe (V-E Day). He returned as a hero to the United States. Eisenhower was overwhelmed with the receptions he received in England and in America. He said, "I'm just a Kansas farmer boy who did his duty." Harry Truman was now President of the United States. It was his decision to use the atomic bombs on Hiroshima and Nagasaki to end the war with Japan. Over 100,000 people were killed, and the Japanese surrendered. World War 2 had ended. After the war was over, it was Eisenhower's job to demobilize* the army. 7 million men and women were discharged from the service and allowed to go home. Five years later President Truman appointed him to be the supreme allied commander of the North Atlantic Treaty Organization (NATO). After retiring from the Army as a Five-star General he became president of Columbia University, but people wanted him to run for President of the United States. He didn't want to, but after seeing the response of the people he decided to seek the Republican nomination. 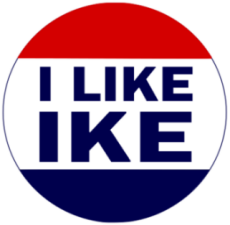 The Republican slogan was We Like Ike. He won the nomination over Robert A. Taft, then chose Richard Nixon to be his running mate. I Like Ike campaign buttons were distributed. When he was campaigning, ads were created that showed him talking to ordinary Americans. These ads were run on television before and after the very popular I Love Lucy show. In 1952 one newspaper poll found Eisenhower to be the most admired living American. People thought of him as "the man who won the war". Eisenhower won by a landslide* over the Democratic nominee, Adlai Stevenson. When the election was over he had 34 million votes and Stevenson had 27 million. By electoral votes he had 442 and Stevenson had 89. 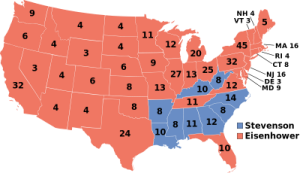 In 1956 he again faced Stevenson and Eisenhower won that election by 9 1/2 million votes. He had 457 electoral votes and Stevenson had 73. His popularity had only increased during the four years he was in office. After World War 2 ended, the United States became embroiled* in the war in Korea. An "arms race" of development of nuclear weapons was entered into by the United States and Russia and China (who were Communist countries). Eisenhower worked to stop the spread of Communism. At the same time in America, Joseph McCarthy was falsely accusing many Americans of being Communists. Eisenhower quietly worked to stop McCarthy's "witch-hunt"* in 1954. In May of 1954 the U.S. Supreme Court in a case called Brown vs the Board of Education of Topeka ordered schools to desegregate and allow black and white children to attend school together. Racial segregation was ruled unconstitutional. Historians fault Eisenhower for not taking a strong stand to guarantee civil rights. He disagreed with the judicial order to desegregate the schools because he thought the problem would be resolved in time without government interference, but he finally implemented the order by sending federal troops into Little Rock so that African American children could attend classes there. 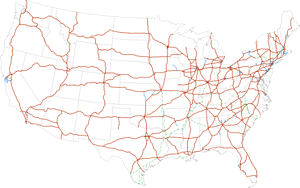 During his presidency one of his major improvements for the country was the development of an interstate highway system. As a young lieutenant colonel he had seen firsthand how hard it was to move Amry convoys across the country on the narrow highways. He proposed, and Congress passed the Federal Aid Highway Act and funded it with an initial $175 million for an interstate highway system. The estimated cost for completing it would be $27 billion. It was such an enormous amount they finally passed legislation for a federal gasoline tax to pay for the system. The final cost was $129 billion and the elaborate system was made up of 47,000 miles of highways joining major cities all over the nation. A person could travel from coast to coast without ever seeing a stop light. In September 1955 Eisenhower had a heart attack. Thousands of get-well cards began arriving at the hospital. While he was recovering, Mamie answered all the cards and letters personally. 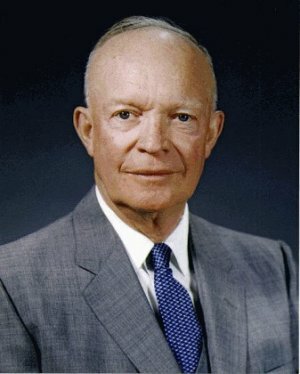 Dwight D. Eisenhower died on March 28, 1969 when his heart failed. He was buried in Abilene, Kansas, the town where he had grown up. Every gun that is made, every warship launched, every rocket fired signifies in the final sense a theft from those who hunger and are not fed, those who are cold and are not clothed. This world in arms is not spending money alone. It is spending the sweat of its laborers, the genius of its scientists, the hopes of its children. This is not a way of life at all in any true sense. Under the cloud of threatening war, it is humanity hanging from a cross of iron. This biography by Patsy Stevens, a retired teacher, was written September 13,2012. Explore the "All About Ike" pages. Press "Go" to search for books about Dwight D. Eisenhower. This page displayed 22,712 times.